Golden barberry (Berberis thunbergii 'Aurea') is grown in USDA hardiness zones 4 to 8. It is a shrub whose foliage offers contrast to the rest of the landscape. Golden barberry usually has a superb bright yellow color and it retains that color well. Due to its appearance, it can be used as an accent to other plants, or in big groupings for a strong impact. When planting, allow for mature plants that will measure about 4 feet tall and 5 feet wide. Sunlight, water, nutrition and pruning are important factors when caring for golden barberry. Plant golden barberry bushes in full sun to partial shade. 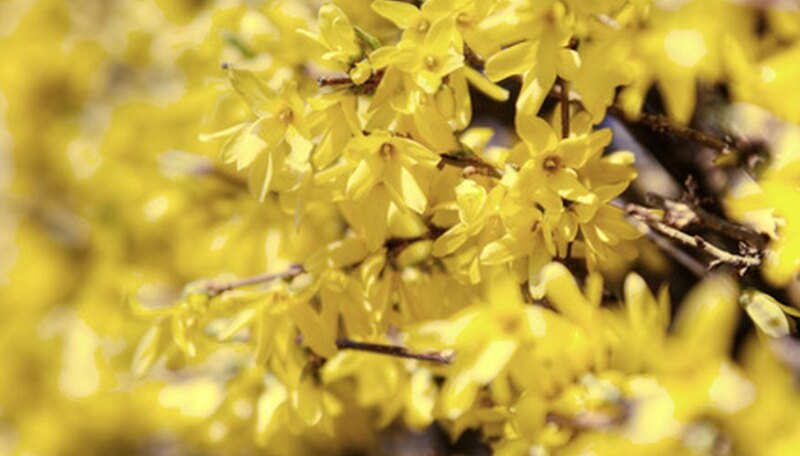 If you notice a plant's foliage isn't bright yellow, it's probably due to a lack of sunlight. Gold barberry foliage has a yellow color when planted in mostly sun but will turn to a lime green in the shade. Use well-draining soil to help the plant thrive. Add a 2 inch layer of mulch twice annually to improve the soil and help with moisture retention. Remove damaged or diseased branches immediately if you spot them during the growing season or in the fall. Branches broken by the weight of ice or snow during the winter can be removed in the spring. Snip branches to maintain the appearance of the barberry and to remove or shorten branches that encroach on other plants in your garden. Snip back branches 1/4 inch above buds, or head off branches by cutting them just above side branches. Trim plants being maintained as a hedge to the desired height and width using hedge clippers. Trim every 8 weeks during the growing season, or trim once in the spring and once in the fall. Cut off old woody canes at the center of the plant in late winter or early spring when the plant is still dormant. An overgrown barberry may be "cut back hard" down to just above the ground at this time. Barberry responds well to these drastic pruning methods by putting out vigorous new growth. Water the golden barberry regularly to keep the soil moist. Feel the ground beneath the plant every few days. If it is dry to the touch 1 inch below the surface, add water until moist. Feed with an all-purpose fertilizer in the early spring, prior to new growth. Use a water soluble blend or granular food made for trees and shrubs. Make sure it has a nitrogen-phosphorus-potassium ratio of 6-12-12 or 10-10-10. Apply it, as per manufacturer's instructions, once a week through springtime. Do not feed the plant during the hot summer months. Fertilize the plant again in the late summer through mid-autumn if you want to give it more nutrition before its dormant period. Wear gloves when pruning golden barberry to protect yourself from thorns. There are other barberry varieties and hybrids with golden or yellow foliage, such as Golden Nugget, Sunjoy Gold Beret and Bonanza Gold (Bogozam). These may be cared for in much the same way as the golden barberry. If you remove diseased branches, destroy them rather than compost them. Disinfect the pruning shears before using them again. What Are the Treatments for Barberry Verticillium Wilt?